I fell in love with Joe Pye Weed in 2012 after bringing home a huge 6' tall clump of the variety 'Gateway' in my car from Philadelphia. It had been growing in a large roof deck container owned by my sister-in-law Chris Carrington of City Garden Guru fame and it really wanted to be planted in the ground. After the six hour trip home, I muscled it out of the car, and decided on a back of the border location where it could help camouflage our home's cement foundation and some mechanical pipes that protrude out of the back of the house. But first I had to remove a huge miscanthus grass that had become too large and was the poster child of the proverbial 'wrong plant, wrong place' variety. At that time I was simply doing Chris a favor by taking this massive plant off her hands. I had no idea just how magnificent and how important my new addition would become in The Big Little Garden. Now in 2018, it's one of my most anticipated plants in the garden. I say anticipated because it takes its good old time making an appearance in the spring. If you plant JPW, do not be alarmed if you don't see any signs of life in the bare dirt the next spring. It can be mid-May before little nubs poke up through the soil, but with sun and warm soil, it will make its presence known quickly. I have since added more 'Gateway' to my garage bed and to the gardens of clients as well as 'Baby Joe' for smaller spaces. 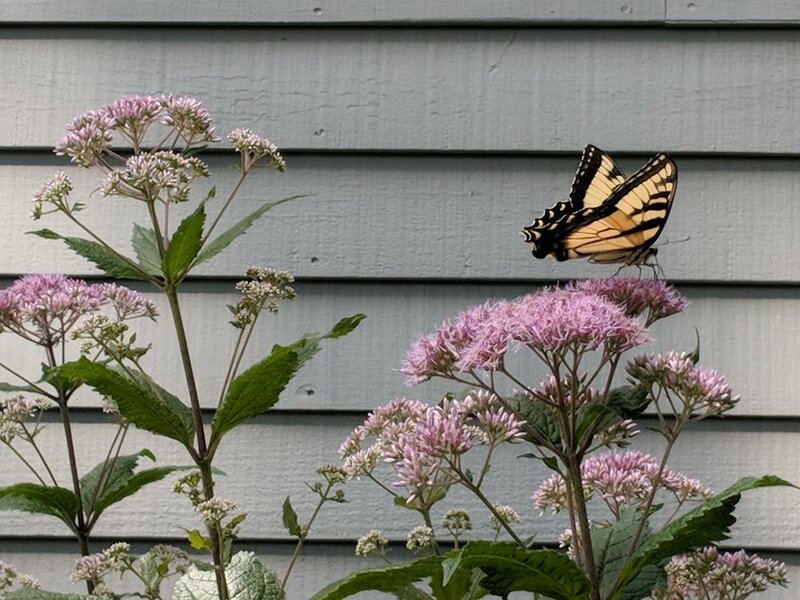 Take the challenge and help pollinators by planting Joe Pye Weed and other important native perennials that are discussed on my website! Pests: since this is a host plant for butterflies and moths, expect some leaf damage from caterpillars in late May. By June, the damage will be hidden by new foliage and by August those caterpillars will now be gorgeous butterflies sipping the Joe Pye Weed nectar during the day and equally beautiful moths at night! The same 'Gateway' plant seen a bit closer up. The whorled leaves and compound inflorescences make a stunning architectural statement in this perennial garden. The purple spikes of Agastache “Black Adder” can be seen at the top right of this photo. 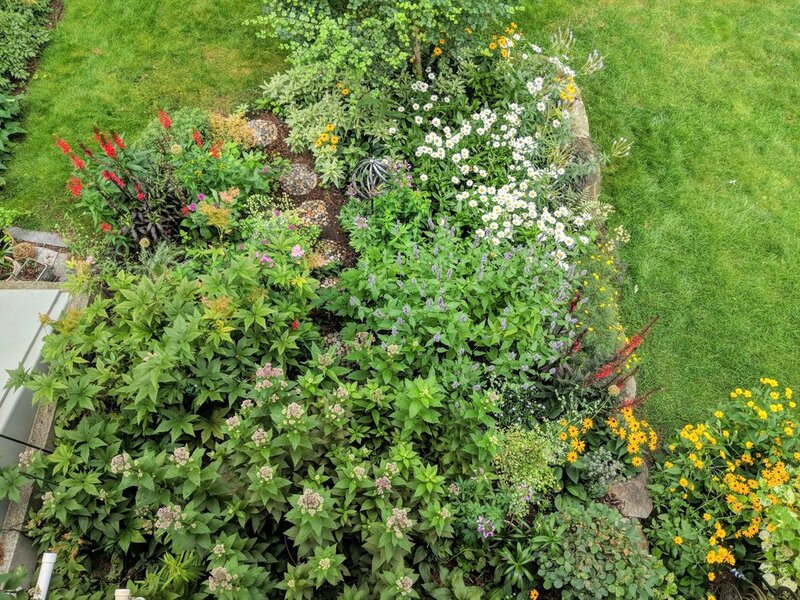 Looking down onto what I call the "Kitchen Garden", Joe Pye Weed's back of the border location is evident. Flanked on the left by Filipendula which bloomed in July and on the right by Thalictrum which bloomed in June, it's now time for 'Gateway' to strut its stuff. 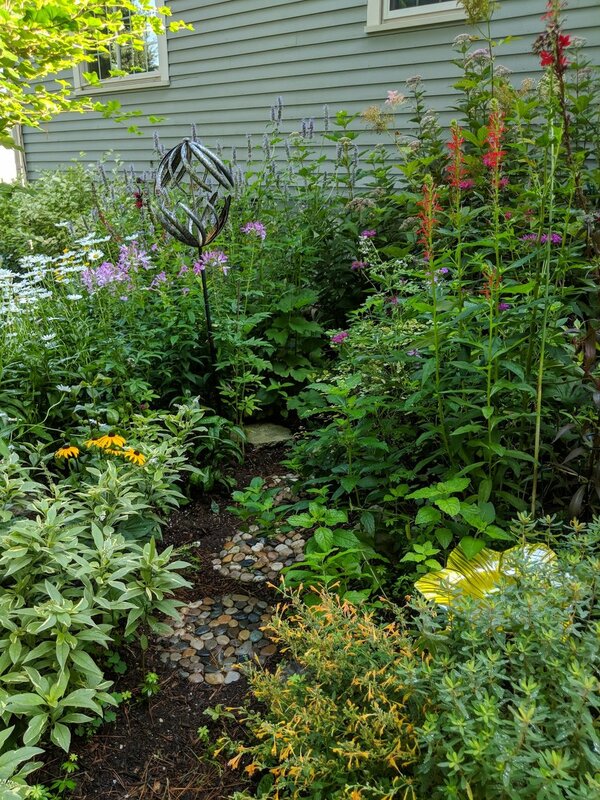 This garden bed receives late morning to afternoon sun, so the foliage is less prone to burning out as compared to the same plant on my East garage bed which is blasted with sun until 1:00 p.m.
Every May and June, my Joe Pye Weed leaves are turned to swiss cheese, but that's OK. I know that it is an important food source and host plant for Swallowtails, Spotted Skippers, Painted Ladies, Eastern Tailed Blues and many different moths that will grace its blooms in a few weeks time. I have not yet identified the caterpillar above and do not know if it eventually became a butterfly or a moth. I long ago realized the importance of biodiversity in the home garden. Whatever it is, it will certainly become beautiful and will probably become bird food. So, just leave it be! The stone path leads to the Joe Pye Weed towering at the back of the Kitchen Garden bed. Blooms of other tall pink plants (Thalictrum and Filipendula) are spent, so the Joe Pye Weed is perfectly timed to take center stage. Pink blooms are complemented by purple Agastache 'Black Adder'. 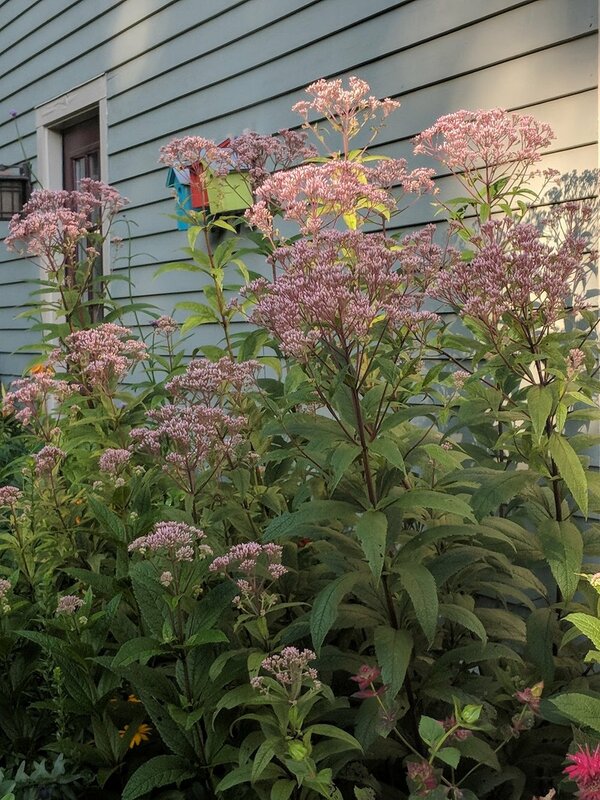 Click through the photos above for a closer look at Joe Pye Weed growing in two different sun/shade locations in The Big Little Garden. Observe how the leaf damage seen in June has completely disappeared beneath whorls of beautiful, damage-free foliage. This fantastic perennial can be difficult to find at your local nurseries. I source the best specimens at select New Hampshire wholesale growers. 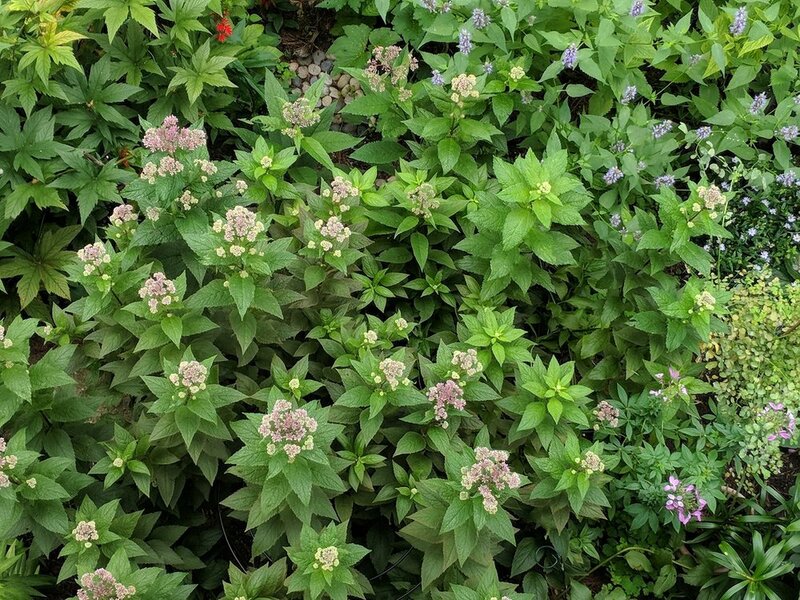 If you are interested in learning more about Joe Pye Weed, or want to include it or other hard-to-find perennials in your garden, just click the button below!